We had one of the best of dinners tonight – not in the sense that the food was particularly wonderful, but in the sense that we thoroughly enjoyed hanging out with friends over a yummy, healthy dinner that was certainly good enough. I’ve been making this recipe for years and I love how interactive it is. The bits and pieces for each parcel were passed backward and forward over the table and people made up their rolls to suit their tastes. Originally from the Woman’s Weekly Cookbook, Low Carb, Low Fat, I’ve tweaked the recipe to be made in rice paper rolls, rather than lettuce leaves. I also add rice vermicelli noodles and fresh coriander to the table of fillings, to make the whole thing go further. Do feel free to make it work for you by adding crunchy vegetables or whatever fillings takes your fancy. Although the ingredients include pork and beef mince, I should tell you that I’ve often made this only on beef mince if that’s what I’ve got in the freezer, and it still tastes great. This recipe costs no more than $8 and serves 4 people generously. This recipe works well for bigger crowds simply by doubling or quadrupling the quantities. Heat oil in a wok; stir fry brown onion and garlic until onion softens. Add both minces; stir fry until cooked through. Add sauces and capsicum, reduce heat; simmer, uncovered, stirring occasionally 3 minutes. 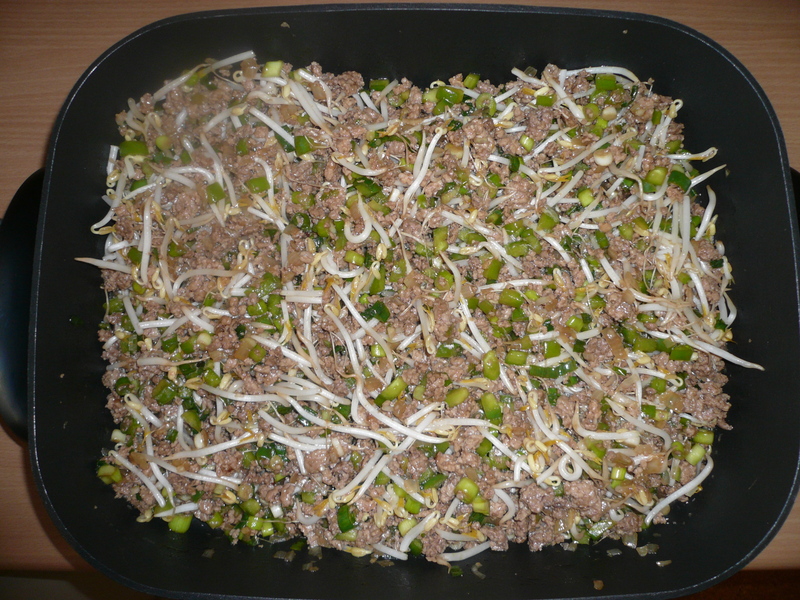 Just before serving, stir in sprouts and shallots. Serve in the centre of the table with little bowls of fresh coriander, baby spinach, rice vermicelli noodles and whatever vegetables you like. Wrap all these elements in your choice of lettuce cups or rice paper rolls . If opting for the latter, use a bowl of warm water from the kettle in the centre of the table to soften each rice sheet before wrapping the mince filling. I made these the other day and they went down very well. However, I couldn’t get hold of rice paper rolls where I live in England. Can any Brits tell me where to buy them?